Helen and I have just come back from a short tour of the lakes while staying at my mother’s static caravan near Bouth. For obvious reasons I went on the Viffer, luggage, fuel range etc.. Getting on it for the 1st time since getting the ZX-9R it felt like riding a comfy chair. We set out at around 11:00am on Sunday and headed up the A56/M66 to Clitheroe. However as seems to be the norm I forgot the caravan keys so had to turn back after about 5 miles. Helen carried on to Clitheroe services and we met back up after I had gone back for the keys. We filled up at Clitheroe and then headed into Clitheroe and then got on the B6478 to Slaidburn via Newton Fells. We then turned left in Newton and took the road to Dunsop Bridge. We then turned right and took the road through the Trough of Bowland. They still have the road blocked off near Lee Bridge and you are diverted through Abbeystead before rejoining the main road just before the Tower. We then turned left in Quernmore and headed over to Caton and joined the A683 to Kirkby Lonsdale. We stopped at Devil’s for a brew but it was far too busy, so decided to just go to the caravan. 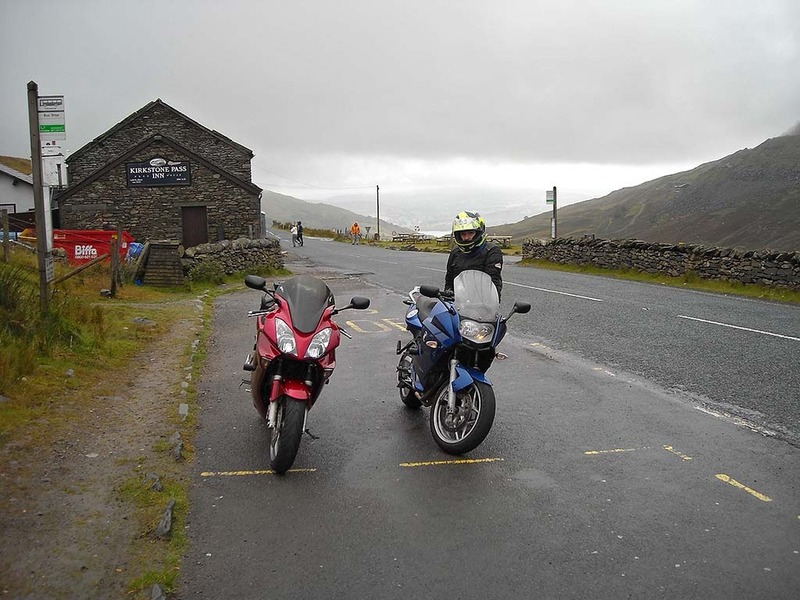 We left Devil’s and headed on the A65 towards the M6. We crossed over the M6 and joined the A590 to Kendal. 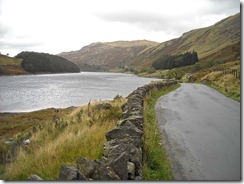 We continued on the A590 all the way to the caravan at Bouth. We set out at around 10:00am and joined the A5092 at Spark Bridge. We then turned right onto the A5084 to Torver. At Torver we turned right on the A593 to Coniston and then continued on this road to Ambleside via Skelwith Bridge. In Ambleside we joined The Struggle which we took up to the top of Kirkstone Pass, where we stopped at Kirkstone Inn for a brew. 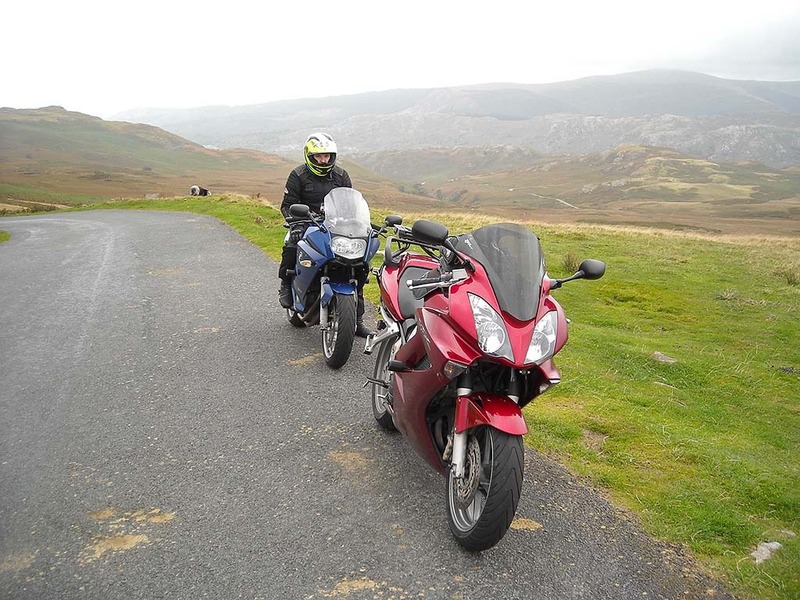 After the brew we went down the otherside of Kirkstone Pass on the A592 and went through Patterdale and Glenridding before riding alongside Ullswater. We turned off the A592 at Waterfoot and joined the B5320 to Eamont Bridge, just after Pooley Bridge we turned right onto minor roads to Askham. 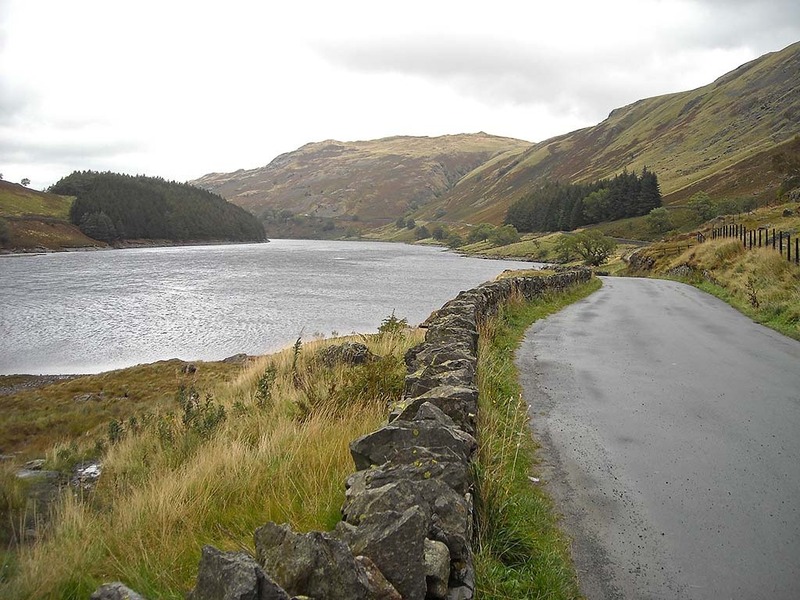 We then continued on minor roads through Helton and Bampton before joining the road to Haweswater Reservoir. We rode alongside the reservoir to the far end where the road ends. 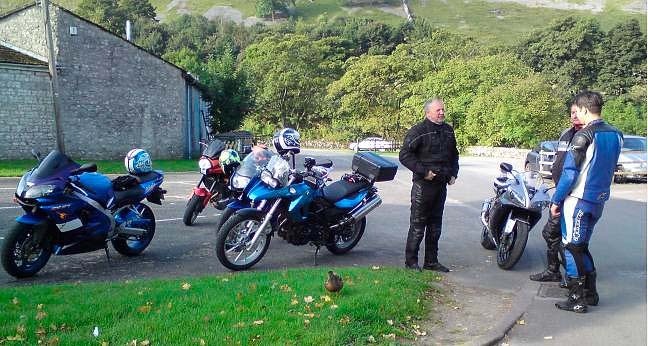 We stopped for a brief while to take some pictures and then went back along the road again briefly stopping at Haweswater Hotel. Unfortunately they don’t serve food on Mondays and Tuesdays due to hardly any passing custom. So we headed over to Shap via Bampton Grange and Rosgill where we managed to find a pub serving food. We left Shap on the A6 heading to Kendal and soon hit some very wet and windy weather. We were not able to enjoy the road due to the poor conditions. We stopped in Kendal for some fuel and then after dodging a lunatic car driver, who nearly had me before deliberately crashing into a people carrier, we then joined the A591 and then the A590 back to the caravan in Bouth. We set out at about 11:00am and joined the A5092 at Spark Bridge. We took the A5092 to Grizebeck where we joined the A595. 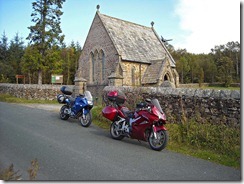 We took the A595 all the way to Ravenglass and then joined minor roads to Santon Bridge. 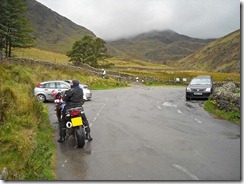 We then joined the road to Wasdale Head and rode alongside Wast Water to the end. 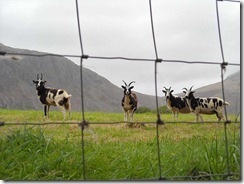 We stopped at Ritson’s Bar at Wasdale Head for a spot of lunch. After lunch we rode back alongside Wast Water before stopping for the obligatory photo of sheep for Helen. 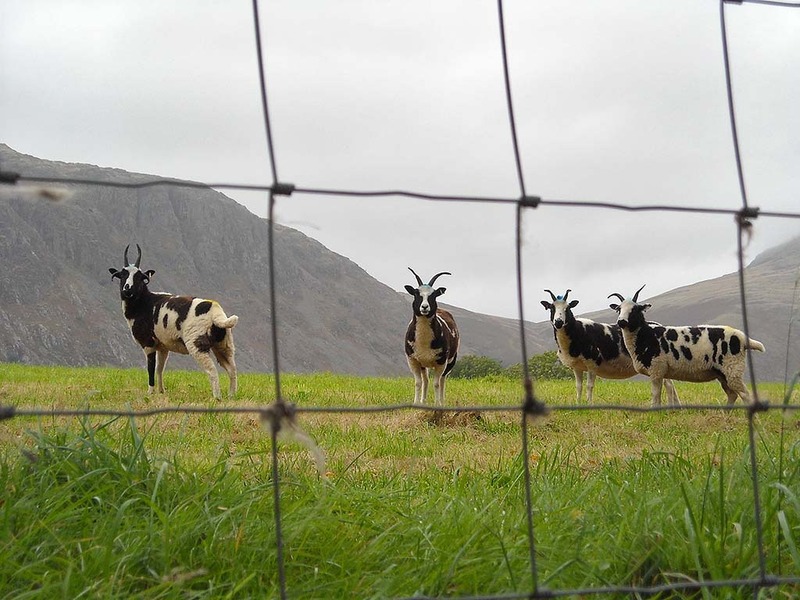 We then headed through Eskdale Green and over Birker Fell to the steep hairpins at Ulpha. 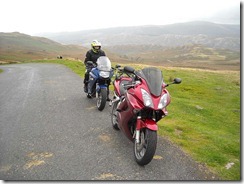 We then continued on and went over Dunnerdale Fells to Duddon Bridge where we joined the A595 again. We then joined the A5092 at Grizeback and headed back to the caravan via Spark Bridge and a quick drink in the White Hart Inn in Bouth. 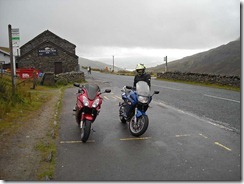 We set out at around 11:00am and headed on the A590 towards the M6. 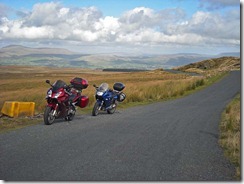 We went over the M6 and joined the A65 to Kirkby Lonsdale. We stopped in Kirkby Lonsdale so Helen could go to the cheese shop. We then proceeded over to Devil’s Bridge for a bacon butty and a brew. We left Devil’s on the A65 and just after Ingleton we turned onto minor roads and went over Clapham Common and past Stocks Reservoir. We then joined the B6478 to Clitheroe via Slaidburn and Waddington. We then proceeded home via the A56/M66. 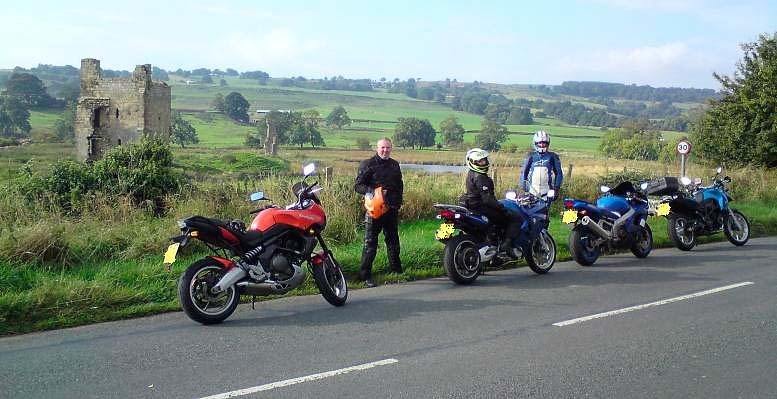 Helen and I went out with NUKB last Saturday on a rideout to Blanchland. The rideout was planned and led by DocB. 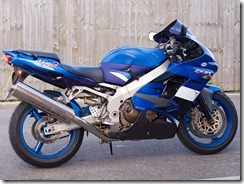 I decided as the weather looked pretty good all day that it was a good time to try out the ZX-9R. We meet up at Clitheroe services at 8:00am and then set out on the A59 to Skipton. Just after Skipton we turned left onto the B6265 and headed on up to Kettlewell where we stopped for a brief comfort break. We left Kettlewell and immediately dropped onto the goat tracks over North Moor and then joined the A684 into Leyburn. In Leyburn we then took the A6108 towards Richmond. Before we got to Richmond we turned left onto minor roads and headed over High Moor and through Ravensworth before turning left onto the A66. We then headed up the A66 before turning right and heading into Barnard Castle for a brew. Helen also visited a craft shop and bought a porcelain pig, which she has named Barnard (even though it is a sow). We left Barnard Castle and headed on the B6278 heading for Egglestone. We continued on the B6278 through Egglestone and headed over Egglestone Common and then Bollihope Common. We then arrived in Stanhope and after crossing the river once again continued on the B6278, shortly after leaving Stanhope we turned left and went over Edmondbyers Common and into Blanchland for lunch. Here is some previous on-board video footage that I shot on the B6278 earlier in the year. 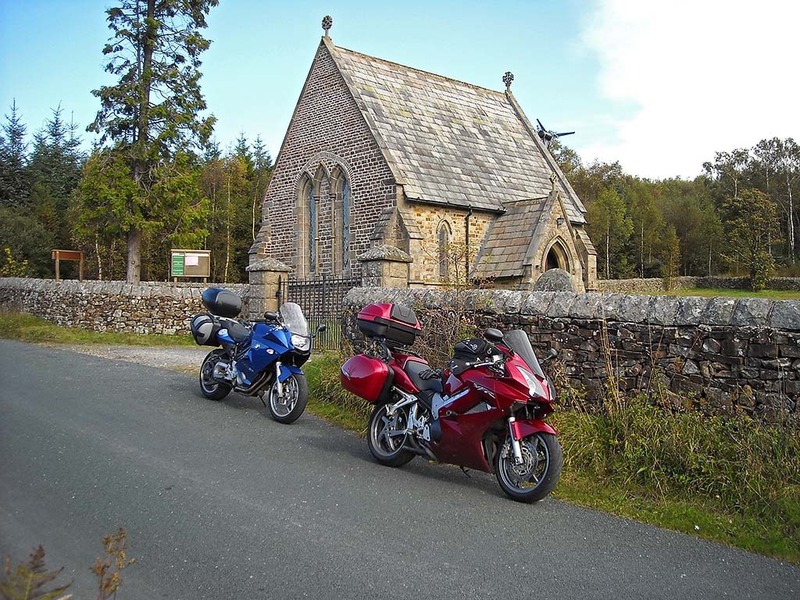 B6278 to Blanchland on Honda VFR800 Vtec from Cavturbo on Vimeo. We left Blanchland on minor roads and went over Hunstanworth Moor and then dropped down into Lintzgarth. We then went over Lintzgarth Common before arriving in Westgate. We then had to make a slight detour to avoid a ford before going over Langdon Common. We then joined the B6277 and headed into Middleton-in-Teesdale for ice creams. We left Middleton-in-Teesdale on the B6276 heading towards Brough, passing by Selset Reservoir. In Brough we joined the A685 to Kirkby Stephen and then headed on the A683 to Sedburgh. Once past Sedburgh we continued on the A683 to Devil’s Bridge. 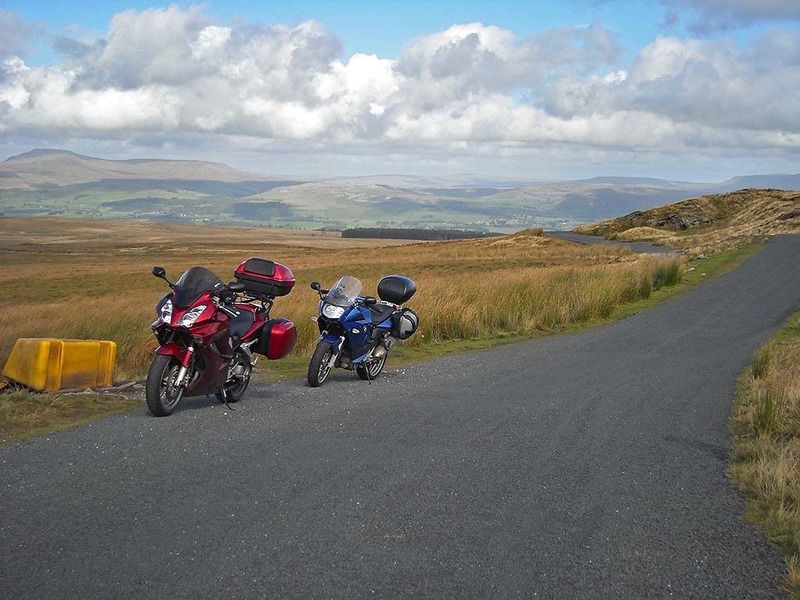 We stopped at Devil’s for a brief break before joining the A65 towards Settle. After Ingleton we turned onto minor roads and went over Clapham Common and past Stocks Reservoir. We then continued on minor roads to Sawley and then joined the A59 to Clitheroe. We then proceeded home via the A56/M66. The ZX-9R performed perfectly all day and was fairly happy on the goat tracks we went on today. It was also pretty comfortable and the 200 mile rideout didn’t seem to cause me any problems either. Well because the bike has been sitting idle pretty much for the last 2 years I decided that it needed a good service. So I replaced the oil and filter, I also replaced the air filter and coolant. I also cleaned out the filthy coolant filter and also changed out the plugs for a nice set of iridium ones. After removing the plugs I had a look at them all next to each other. 1 of the plugs had less tanning than the other 3, non of the plugs showed signs of any other problems though. After I had put the bike together I started it up and instantly noticed that it sounded different and idled better. When I revved it, it sounded more zingy and less throaty. I took the bike out for a quick spin and it has been utterly transformed. It now pulls very strong from low down before charging for the horizon past 6000 rpms. If I didn’t know any better I would say that it had only been running on 3 cylinders. I am going to leave the rest of the servicing requirements for now as the bike isn’t that far off its 7500 miles service interval. That will also include it 1st ever valve check. Will also balance the cards at the same time, as they will have to come off to get at the head anyway. I will also change out the brake fluid as well, the front brakes feel fine at the moment but the back does feel a little spongy. 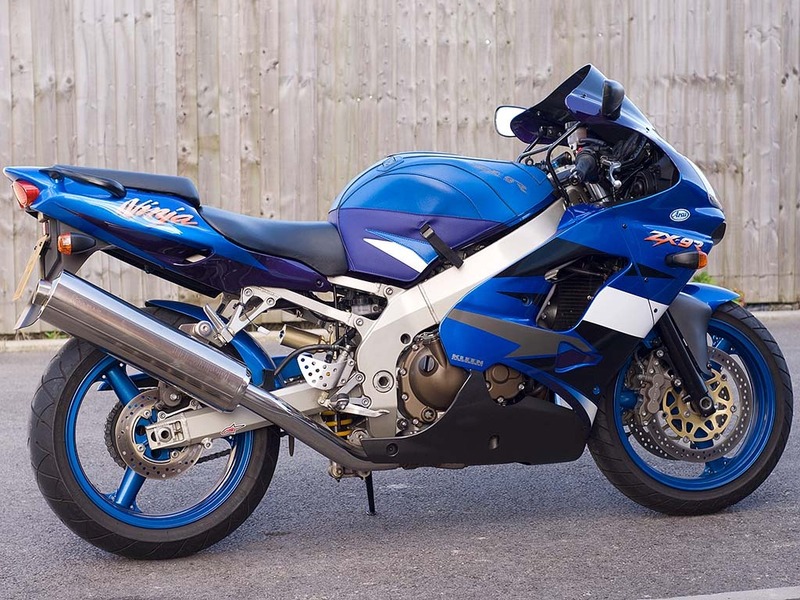 Here is my new toy a 2001 ZX-9R E1. Apart from a slight altercation with some tarmac on it's right side at some point in its life, its pretty tidy. Only done 6500 miles so far in its life, main reason why I bought it. It's only done 60 miles in the last 2 years, the engine does feel a bit tight, probably just needs a bloody good service. And no. I haven't sold the Viffer, this is my cunning plan to stop so many miles going on the Viffer. Recently took the VFR in for its 16,000 mile service at Rochdale Honda. Well I knew it was going to be expensive, thankfully all valves and shims were fine but it still cost me £470. I'll give it to them though the bike did feel really nice to ride afterwards. Expensive things to run these viffers, although plans are at foot to reduce my current mileage on this bike.